Chadwick Boseman explodes on the screen as Black Panther (Not literally. Calm down.) and has great chemistry with the cast. Black Panther is easily one of the best performance we have seen in a Marvel movie. Boseman captures the character’s different levels of bravery and fear in his performance. What really steals the show within this movie, is the setting of Wakanda. You can easily speculate that this movie took so long to make it in development was due to the challenge of bringing this African city to life. Let me tell you it is well worth the wait. Not only the city, but the wardrobe, and music all stand out with their creative use of blending African cultures into this futuristic city landscape. For the first time in years, I watched a superhero movie and felt like I was seeing something different. The best way I can describe this movie is it’s like James Bond that takes place in Africa. There are the cool car chases, the gadget show off scene and a huge political thriller element. Michael B. Jordan plays the comic villain, Killmonger, and almost steals the show. His villain presents a strong backstory, and solid character arc we don’t normally get in a hero movie. There are some times in the movie where the plot seems to slow down. The opening of the movie takes a while for the gears to fully go into motion. Jordan’s villain Killmonger shares the spotlight with the return of Claw, the villain from “Avengers: Age of Ultron” played by Andy Serkis. At first their arc feels like two different entities, which doesn’t give the first half of the story a solid direction. The story also presents a fair share of political banter that potentially could have been cut down. As it seemed it slowed the movie down a little bit. These aren’t truly huge complaints, but more nitpicks as the movie was a blast. Black Panther is easily one of the best Marvel movies to come out in years. Even if you are growing tired of the superhero genre I still highly recommend this movie. In fact, for the longest time I felt like Marvel movies weren’t really “movies” anymore. More installments to get ready for the next film. 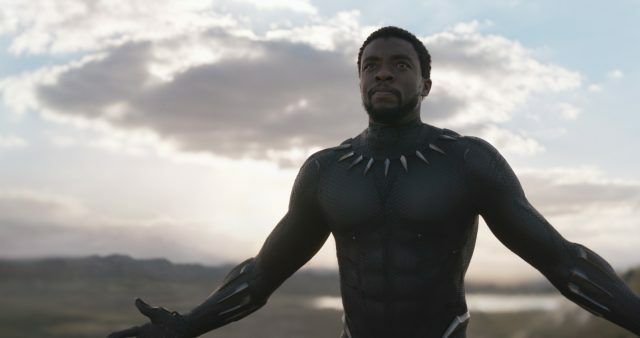 I certainly enjoyed movies like “Thor: Ragnarok” and “Spiderman: Homecoming.” But they felt like “Episode 18 of the Marvel Cinematic Universe.” Black Panther felt like a movie, with its strong use of themes, gorgeous scenery, and brilliant performances all around. I give Black Panther 9 out of 10 re-shoots. It’s a must-see.